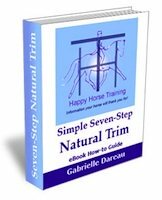 The ultimate dressage solution lies in the straightness of horse and rider because this is the only way it is possible to balance the horse's movement without blocking it. Why Is Straightness So Important In Dressage? To understand the importance of straightness as the ultimate dressage solution, we have to stop thinking of the horse as a static object and start considering the dynamics of his movement as a continuous flow, like the water in a river. The main energy of the horse's movement is generated by the propulsion of the hind-legs pushing off the ground. This propulsion creates a repetitive thrust of energy through through horse's body, sending it forwards in the direction of the thrust. This dynamic can be likened to a golfer striking a ball with a golf club: the thrust of the club is transferred to the ball which results in it being projected forwards in a specific direction, speed and spin. These elements of the ball's motion (before it is influenced by any external factors such as weather conditions) are a direct consequence of how the initial thrust (strike with the club) was controlled. In exactly the same way, when the thrust of each hind-leg pushes against the mass of the horse's body, the resulting direction, speed and balance that his body travels forwards with is directly dependent on the trajectory, placement and energy of the hind-leg thrust. Coming back to why straightness is the ultimate dressage solution, it is only when we can make this thrust of the hind-legs push straight into the mass of the horse's body, at the same time keeping the horse's whole body aligned relative to it, that a balanced flow of movement will result. Imagine the golf shot again - when the player slices the shot, for example, he loses control of the speed and direction of the ball because the energy was not transferred in the right way from swing to ball. When he hits a 'sweet' or pure shot however, the control of the ball is maximal, and he can put as much energy as he wants into the shot without precision being lost. When both a horse's hind-legs are hitting 'pure shots' this is what is meant by the familiar dressage saying that 'both hind-legs should drive evenly'. When this even push-through happens, the ring of engagement is activated, and the horse's movement is channeled into a circular, self-balancing flow. When a horse is crooked (which all horses naturally are, to a greater or lesser degree) the hind-legs are each stride 'playing' sliced or hooked shots, to continue the golfing analogy, resulting in little transmission of energy longitudinally through the horse's body to initiate the ring of engagement. Only when we can straighten the trajectory of the hind-leg relative to the horse's body alignment can we control the balance, direction and power of the horse's movement. This control is what dressage is all about, so straightness is the ultimate dressage solution. The difficulty with creating this balanced movement flow of movement through straightness is that the rider is not directly connected to the horse's hind-leg in the same way that a golfer is to his/her club. The rider is responsible for establishing and maintaining the alignment of the horse's entire body relative to the hind-leg thrust only by means of their own straightness through postural influence and aiding. This is an extraordinarily difficult challenge, because a rider has no external fulcrum of support (such as the ground for the golfer) when sitting on a horse's back, and on top of that there is immense room for misalignment in both the horse's and the rider's body, and within the interaction between the two. 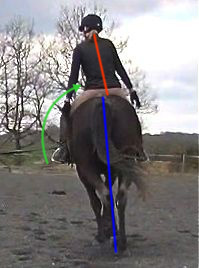 The left-hand picture here (horse working on a left circle) shows the rider posturally misaligned with the horse, because she has been displaced to the outside by the rotation of the horse's ribcage - the natural consequence of the hind-leg thrust when it is not successfully channeled into transmission. 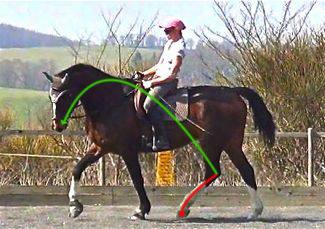 The right-hand picture (on a right circle) shows the rider successfully maintaining her postural alignment in order to channel the hind-leg thrust into forwards transmission. 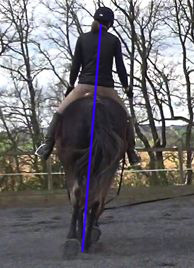 Note that in the picture showing alignment the horse is stretching down (you can this see from the angle of the side-reins and lunge-line), as opposed to the first picture where his head is up. Longitudinal flexion, crucial to the ultimate dressage goal of engagement, is totally dependent on the alignment of horse and rider. The rider must develop their seat, posture, weight and aiding as tools to channel the horse's body into alignment with the hind-leg thrust, at the same time as drawing that thrust further under the horse's body mass via the longitudinal stretch (raising of the horse's back and tucking of his pelvis). The transmission of energy forwards into the contact to complete the ring of engagement is not only lost at the level of hind-leg misalignment, the energy is dissipated in different ways throughout the horse's whole body, for example by side-to-side rotation of the ribcage, lateral pivoting of the haunches, and misalignment of the shoulders. The ultimate dressage challenge for the rider is to counteract these various energy losses so that the propulsion is carried straight though to be received by the allowing hand. 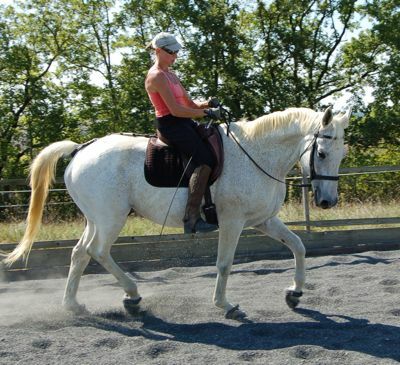 Ways of channeling the horse through the direction of his body (such as bending, lateral work and so on) are crucial to developing the straightness that achieves ultimate dressage control, but all exercises must be done towards the goal of genuine alignment, otherwise they are meaningless. The complexity of straightening oneself as a rider and the horse is so great that we cannot expect to understand it in an analytical way, instead we must use a combination of our intuitive feel and certain postural landmarks to discern the right path to straightness. 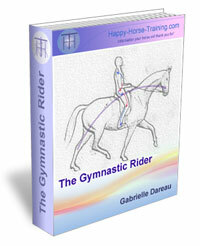 Our main guidance on this path becomes the gymnastic feedback we receive from the horse. 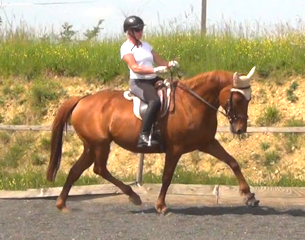 Engagement is a natural result of straightness, so when we feel the connection take place between the supporting hind-leg and the softening of the horse into the contact (without the 'help' of fiddling hands!) with the horse's back stretching and lifting us in-between, we know that we have achieved true straightness. It is nothing to do with whether you can ride down the centre line without deviating! A crooked horse can make apparently straight trajectories in the arena, while inner straightness is still missing. Engagement remains the ultimate dressage goal, and the only true validation of good work. The basic physical makeup of the horse plays a huge part in determining how easily transmission from the hind-leg is generated and then conveyed through the horse's body. In much the same way as a golfer would struggle to hit a good shot with a bent club, a horse's joints being conformationally misaligned is a great challenge for the rider. There are many ways in which conformation can impede transmission, for example a horse being post-legged, or having closed stifles, a weak lumbo-sacral junction and so on, but gymnastic straightening is more than ever the ultimate dressage solution for such horses. Straightening the horse gives suppleness to the joints at the same time as building the right muscular support, and this helps to override conformational weakness and maximize transmission. Once enough straightness is achieved, engagement can take place with all its physical benefits, creating a positive cycle which reenforces the straightening process. 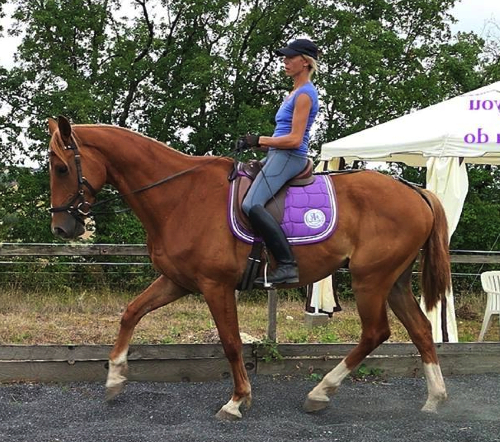 In our experience of working with conformationally challenged horses, it is amazing how much the straightening process can transform the quality of movement and physical appearance of an untalented horse. They may remain limited as to the level their training can take them to compared to a naturally athletic horse, but they can still achieve the beauty of working in engagement, the ultimate dressage goal. For the rider, horses with such limitations can be an invaluable education, because for these horses only true straightening works. It is less easy to get 'results' through trickery, whether it be intentional or unknowingly. Both horses in these photos have considerable conformational drawbacks and began their training with pronounced natural crookedness. Systematic and (very!) patient straightening work has led to them being able to work in engagement and overcome their physical difficulties. They may not be Grand Prix level horses, but they are still capable of giving the rider the wonderful sensation of connecting with a balanced flow of movement. Straightness achieved through gymnastic training is not just the ultimate dressage solution, it is actually a powerful aid in healing and resolving many health issues of both horse and rider. When movement flows through the body in straightness, the nervous system is stimulated in a way that promotes health both of the muskulo-skeletal system, and of the organs which depend on structural health for good nerve function. A horse who is trained towards straightness is therefore less prone to, for example, problems of the digestive and respiratory system, limb problems and general bodily wear and tear. A young event horse beginning to find strength in his posture thanks to gymnastic straightening. At the age of 6, he already had many crookedness issues compounded by his natural weakness and his previous training. 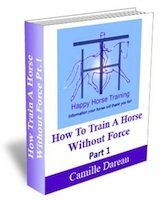 There is one absolute prerequisite for the alignment of the horse's flow of movement described above: there must be a free flow of movement which is not blocked by a restrictive contact. Straightness cannot be achieved when the transmission generated by the thrust of the hind-leg is blocked by the rider's holding hand, any more than you can attempt to hammer a nail into a block of steel without it bending. 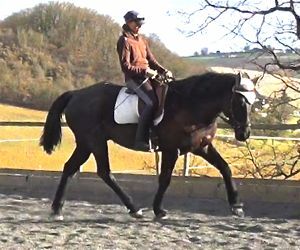 One of the ultimate dressage dilemmas is that it is so tempting and so much easier-seeming to control the horse by restricting the forwards flow of movement with a holding rein contact. The control appears so much more effective and immediate. But this kind of control is equivalent to the golfer, every time he plays a shot, going and plucking the ball out of the air and placing it manually next to the hole. In this example it is obvious how the whole beauty of the game would be lost... if only it were so clear in riding! But in riding, everything is going on within the bio-mechanics between horse and rider, and the cheating can only be seen by an educated eye. The rider who chooses to straighten their horse without blocking the free flow of movement appears to have sacrificed precision and control at many stages of training, because it takes time to get consistently good at directing the ball towards the hole! 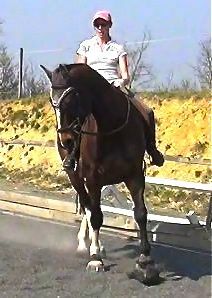 Whereas the rider who blocks the movement seems to be able to get everything 'just so' straight away. 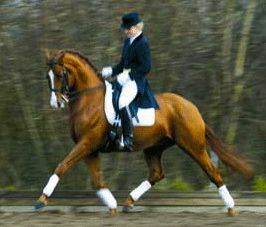 One of the biggest problems of the competitive dressage system is that it favours the rider who 'cheats' by consistently rewarding their precision, and failing to recognize the fact that this rider is no longer 'playing' the same sport as the rider who achieves control through straightness and engagement. We are not referring to 'cheating' in a judgmental way here - competitive dressage has become a sport in its own right with its own challenges - but it must be recognised that these are not the same challenges as those of pure, gymnastic dressage founded on engagement. The bottom line is that only one of these two forms of training is actually beneficial to the horse. Tali is a horse who came to us with deep issues in both body and mind, broken and traumatised by forceful training techniques. A long gymnastic straightening process, combined with extensive Cranio-Sacral Therapy and a holistic lifestyle, was the only solution for him to be ridden without constraint and tension. Here he is enjoying the liberty of balanced movement and self-carriage and a new-found relaxation under saddle.